Oct. 24, 2012 - PRLog -- (Troy, Mich.) Casite’s booth (#4426) at the 2012 Automotive Aftermarket Products Expo (AAPEX) Show in Las Vegas, Nev. will be buzzing with activity. The renowned automotive chemical company that’s been producing premium automotive chemicals for over nine decades to keep cars and trucks running strong will unveil two new products during this year’s show at the Sands Expo Center from October 30 - November 1. The newest additions to Casite’s premium product line are the Motor Honey High Mileage Oil Treatment and Motor Honey Fuel Economy Improver, both developed to enhance the performance of most cars and trucks. Motor Honey High Mileage Oil Treatment is specially formulated to reduce oil consumption, stop smoke and extend engine life. Motor Honey Fuel Economy Improver is specially formulated to clean injectors, lubricate upper cylinders and improve gas mileage. With the ever growing demands on today’s vehicles, the need for proper maintenance is essential. 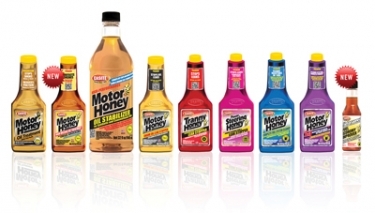 Motor Honey products will not only help vehicles last longer, but will also help vehicle owners save money in the long run. Casite will also show off its new packaging, which has been redesigned to meet the changing business needs of distributors and retailers while being more consumer friendly. In celebration of its 90th anniversary, Casite will also announce their “Show Us Your Motor Honey” promotion that will award prizes throughout 2013 to car and truck enthusiasts who take pride in keeping their vehicles in top shape. Fans will be able to join the fun by going to www.casite.com/promotions and enter to win some cool items once the promotion has started. To see upcoming Casite events, please like us on Facebook.